Akron’s Kenmore neighborhood will undergo a two-day transformation Sept. 1 and 2 as it hosts Better Block, a neighborhood engagement effort in which residents will reshape and reactivate their community’s built environment. Kenmore Neighborhood Alliance will host a kickoff meeting May 25 from 6 to 8 p.m. at the Rialto Theatre at 1000 Kenmore Boulevard. Residents, business and property owners, and other stakeholders are invited to share their ideas for the business district. More information about the kickoff event is available at www.facebook.com/AkronBetterBlock. Mark Lakeman, founder of Portland City Repair, saw a lack of communal meeting places in his community. Now his city has made changes in their infrastructure to bring community members together. Lakeman brought his knowledge of placemaking to the March 9 meeting of The Great Akron Innovation Network for Sustainability, or GAINS, hosted in the Summit Artspace in collaboration with Big Love Fest. GAINS is a volunteer organization that promotes sustainability in the Greater Akron area, while Big Love Fest is an event that celebrates culture, art and music in the Akron community. 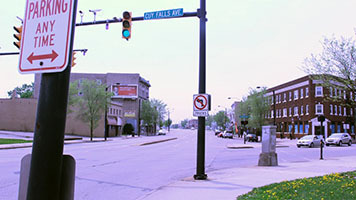 Photo of Main Street in Akron, Ohio by Flickr user Kevin T. Quinn. Have you heard the term Better Block? It’s spreading fast here in Akron these days. Google “Better Block, Akron Ohio” and you’ll see nine different references. The Better Block is a community development demonstration tool that uses grassroots efforts to show residents the potential to create a walkable, bikeable, lively, neighborhood center. The project helps residents envision “what could be,” with temporary “pop-up” businesses, bicycle lanes and pedestrian friendly design. Better Blocks are being performed in cities around the world, and have helped communities rapidly implement neighborhood improvements that can become permanent. The Knight Foundation and Team Better Block have begun laying the groundwork for their first collaboration with the city of Akron. The North Hill neighborhood has been selected for the city’s first Better Block, and residents, business owners, and city staff have partnered to prepare the Temple Square block (Cuyahoga Falls Avenue and Main Street) for this transformation.